The Testament of Harold's Wife by Lynne Hugo is a highly recommended novel featuring an independent older woman with a plan to get revenge. First a drunk driver killed her beloved grandson, Cody. Then her husband, Harold, committed suicide. Louisa knows Harold was trying to get revenge on the man who killed Cody, who claimed there was a deer in the road and was never held accountable for the death. Gus, the local sheriff, kept an eye on Harold and interfered with his plans at every turn. Now, with Harold gone Louisa decides that it is time for her to continue Harold's plan and get revenge on the killer. Now her adult son, Gary, who has dealt with Cody's death by becoming a minister, is keeping an eye on Louisa (along with Gus). Gary seems to think there is something wrong with Louisa having her chickens inside the house and talking to them. But, Louisa knows how to execute a plan and keep ahead of those who want to interfere. 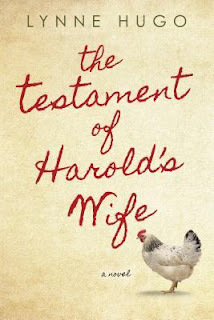 The Testament of Harold's Wife is a humorous, fast paced novel. Each chapter is told through a different character's point-of-view, with the bulk of the novel following Louisa and her plans. It is an original novel with a rather charming, folksy, heroine who is grieving her losses without feeling sorry for herself. Instead she makes a plan and sets out to get the killer. The bulk of the character envelopment is, naturally, for Louisa. And while she is appealing, she does seem to act and talk older than she really is for no obvious reason. I enjoyed the novel and there are several pretty funny scenes in it, along with several touching moments and recollections. It is an entertaining and has some poignant moments. Louisa is honest when she shares her feeling and observations about those in her life. I was interested in her plan to get revenge and how it would all play out. The ending was a satisfying conclusion to the story. (On the other hand, I guess I don't find quite as much charm as some readers in Louisa discussing giving alcohol to her chickens and cat.) In the end, this is a satisfying novel about a woman dealing with grief, with humor, practicality, and looking ahead to her future.